When there is mold present in a home or business, it is not always discovered immediately. Mold thrives in damp, dark places such as behind walls, ceilings and cabinets - all places where it can hide quite easily. We often get calls from our clients when they discover mold during a renovation - the cabinets or appliances have been moved and the mold becomes evident. Leaking or poorly ventilated attics and flooded basements are also prime spots for mold growth. Mold can grow within days after a structure has had water damage and spread quickly if not addressed. 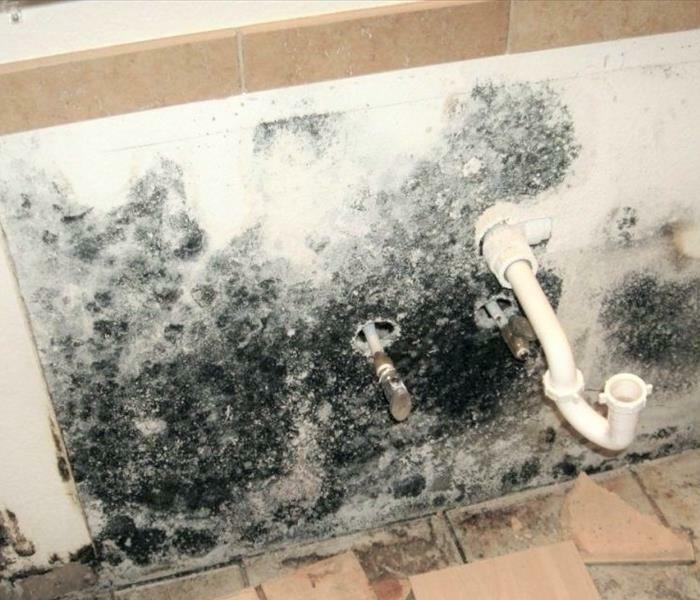 You might find yourself becoming concerned about a mold infestation if you notice a musty smell, see suspicious black stains on your cabinets or are experiencing an unexplained illness. If you feel unsettled about whether there might be mold in your home, call us at (203) 267-6262 to schedule an appointment. Regardless of whether or not your home needs professional remediation, an inspection by our experts will give you peace of mind. In the meantime, there are a few tips that our mold remediation technicians advise you follow to reduce your exposure to mold any further. Contact SERVPRO of Southbury / Torrington for mold remediation services. If you suspect that your home or business has a mold problem, SERVPRO of Southbury / Torrington has the training, equipment, and expertise to handle the situation.